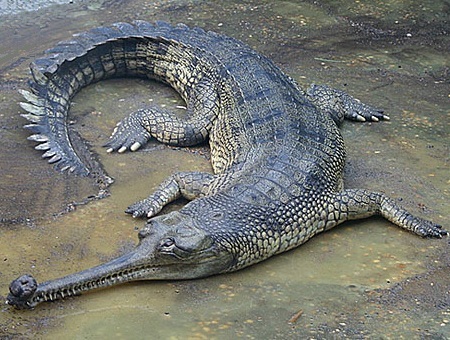 Gharials (also known as ghavials) live only in South Asia. They have the longest snout among the crocodilians. The broad-fronted crocodiles usually feed on animals that venture too near there watery lair, whereas gharials are specialists that eat mostly fish. The gharial catches the fish with a quick sideward snap of its narrow jaws. Once the fish is impaled on its sharp teeth, the gharial lifts its head out of the water, opens its jaws with a jerk and the fish disappears down its throat. 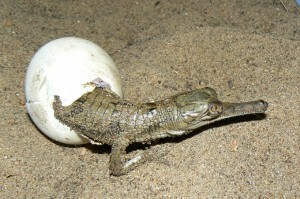 Some gharials ambush small mammals, crabs and even birds from the shore. The male gharial reaches maturity at about 15 years and exhibit a “boss” or rounded growth on the tip of the snout. Although its function is unclear, the result is a hissing sound when it breathes and this becomes part of the male’s territorial defense. The females will dig out a nest in the stream bank and lay 40-60 eggs. She guards the nest for the next couple of months until the eggs begin to hatch. Then, using her snout, she helps the babies emerge from the eggs. But the hatchlings will remain under her care until the monsoon season arrives and the flooding waters disperse them.